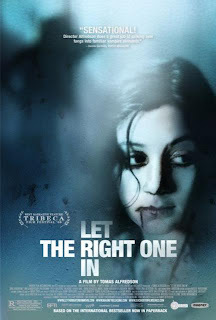 Today I watched a Swedish Horror movie called 'Let the Right One In' (2009). I'd heard many good things about this film, by reading reviews on imdb.com and in Empire magazine. This movie sure was great. You see, people tend to think that Twilight dominates the vampire genre, but it doesn't, not compared to this film. Sadly, I think people don't watch subtitled films because 'they're too hard to keep up with'. Well, this was the first subtitled film I'd ever watched, and I didn't find it hard at all. In fact, I completely forgot that the characters were talking in some language that sounded like gibberish. The story revolves around a young bullied boy, who meets a strange girl in the courtyard outside their block of apartments. The girl has a secret though...she's a vampire who feasts on the blood of innocent people in Stockholm. While watching this, I didn't feel that it was that freaky, but after thinking about it, it was quite a violent and sadistic film. I will remember this film forever as the best vampire film. Don't knock it until you've watched it.